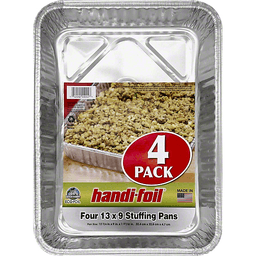 Handi Foil® Eco-Foil® Stuffing Pans 13"x9". Made of 100% recycled aluminum. Pan size: 12 3/4 in. x 9 in. x 1 27/32 in (32.4 cm x 22.8 cm x 4.7 cm). Rinse & recycle. For more info on recycling visit www.eco-foil.com. Visit: www.handi-foil.com. Pan Size: 19-9/16 in x 11-5/8 in x 3-3/16 in (49.7 cm x 29.5 cm x 8.1 cm). With lid. 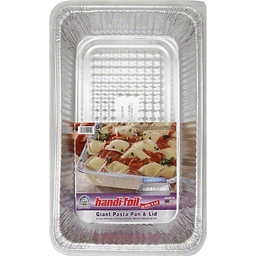 www.handi-foil.com. For more info on recycling visit www.eco-foil.com. Rinse & recycle. Made of 100% recycled aluminum. 100% recycled aluminum. Made in USA.